I book a lot of award travel – not just for myself, but for a lot of other people. It’s at least 10 tickets per month, and usually more than that, so I have gotten a pretty good sense for what is a good award and what isn’t. I have also gotten a good sense for when people get themselves into trouble. One of the biggest problems I see is that people try to over-optimize their award booking to the point of losing the opportunity to fly with points altogether. If you see a good deal, you need to book it right away. Just get the ticket and figure out the details later. This applies to all airline tickets, not just award tickets. Book first and ask questions later. 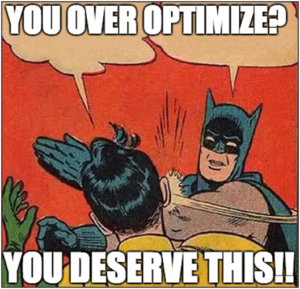 What is over-optimizing? It’s going into an award booking knowing the fundamental bargain (or having been advised of it): airlines give away the seats they don’t think they’ll sell. Those seats aren’t the good seats on nonstop flights with perfect schedules. Instead, you’re flying cross country on a regional jet connecting to another regional jet in Columbus, or traveling on Ethiopian from Los Angeles to Dublin. In Seat 31B, and you’re lucky if it is anything other than that. And yet, even though you know this, and I briefed you, and you agreed to it, you just dither and dally and tweak and fiddle and try to get a perfect itinerary in Cathay Pacific first class instead of a perfectly good (and entirely reasonable) itinerary in Air China business class. When I say “If you want to go, you really need to book this right now before it’s gone,” you say “I need to ask my wife” and disappear for a day or three while you try to search for something better on your own. Even though you hired me to help you. Trust me, although I’m not much of an expert at anything, I’m genuinely an expert at this. Here’s how it ends, all too often. All of the available options evaporate in front of your very eyes because–against my advice (which you have actually paid for)–you don’t immediately book the one highly reasonable option that is available for your travel dates when it becomes available and when I urge you to book it. Traveling around Christmas and New Year? That’s why there was only one option and that is why that option wasn’t a nonstop (which you can almost never get anyway). It was a good option. An option you totally blew. And that is also why there isn’t likely to be another one. At all. I think this is because people read too many blog articles and develop unrealistic expectations. You’ll never hear hype from me on Seat 31B, unless it’s about an unusually good economy class seat. However, other travel blogs so over-hype certain airlines and their business and first class products that literally everyone tries to book them and it means award availability is very limited. Here’s some tough love: You’re not likely to secure those “aspirational” awards at all, and you’re especially not likely to secure them over holidays, and extra especially when you show up 6 months after the booking calendar opened. Full-time bloggers have schedule flexibility where they can literally book and fly the same day, giving them access to last-minute inventory you can’t reasonably use. They all have relationships with the airlines and often fly on complimentary “industry” tickets. You don’t have any of that. Instead, you signed up for a few Chase cards and got a few hundred thousand points just like everyone else did this year, and they’re all chasing the exact same seats on the exact same dates. What’s the reality? If you’re flying in a long-haul business class, it’s far nicer than economy class on pretty much every airline in the world. The baseline is so much of a step up from economy class that the differences between airlines are only incremental. For example, the difference between Air China and Cathay Pacific is pretty marginal. Slightly different catering, better English skill level with a Hong Kong vs. mainland Chinese crew, a different selection of alcoholic beverages and teas, and better lounges in Hong Kong vs. Beijing. That’s it. They will both get you to your destination safely in a modern lie flat seat, giving you a comfortable ride and a nice meal. There are marked differences in economy class. You feel these much more. Premium economy is a major step up from regular economy class. And since there is more economy class award inventory, it is well worth favoring one airline over another (all else being equal). This is particularly true when you’re looking at 9-across vs 10-across economy class seating on a 777. This just isn’t the case with business class. If you’re getting a lie flat seat, worrying about one airline versus another is mostly worrying about which wine is catered. Does it really matter so much that you’d risk losing an opportunity to fly in business class for free? Apparently, it was. You decided to push your luck. Not content with finding an itinerary that met all of your requirements and was really very good, you held out for something better. Except it wasn’t actually there, because airlines barely give away any seats during Christmas and New Year at all, and especially not premium airlines on premium nonstop routes. Instead, someone else snapped up the award you didn’t book. 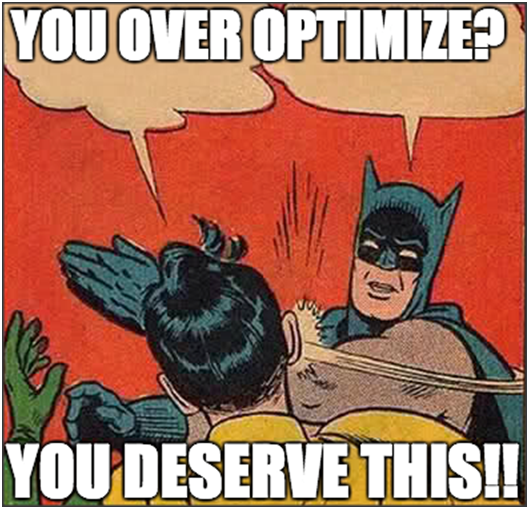 They were happy to have what you were trying to over-optimize. Your opportunity disappeared right in front of your nose. And I know exactly what’s going to happen next. You’re going to be upset with me. You know that stage of a relationship where there isn’t any love left, you’re sleeping in separate bedrooms, but you have kids so you put on a strong public face and stay married for the sake of the children? That’s my view of the relationship between Alaska and American Airlines. It has been steadily deteriorating over time, and while many frequent fliers had a lot of (I think false) hope after Alaska split up with Delta earlier this year, the writing has been on the wall for some time. If you follow airlines closely, you knew something was seriously awry when American began flying from Seattle to Los Angeles earlier this year. This was the only American hub where American didn’t have service on its own aircraft from Seattle, instead relying on Alaska to provide connecting flights to its domestic and international services. And Alaska is fully capable of doing this. They operate 14 nonstop flights a day between Seattle and Los Angeles, not counting an additional 4 Virgin America flights per day. Absent any rift in the partnership, there was absolutely no need for additional lift in this market–a market so competitive (in between Delta, Alaska, Spirit, United and now American) that fares are often as low as $59 each way. Also, consumer preference almost definitely isn’t in play; American service is inferior to Alaska in just about every way so it’s hard to imagine many consumers going out of their way to fly American over Alaska. Meanwhile, though, Alaska fliers are the “kids” in the relationship. Despite struggles in the marriage, it has been very good for us with reciprocal frequent flier benefits. Elite frequent flier members have benefited from free bags and priority check-in, boarding and seating. For those of us in Seat 31B, however, the best part of this has been some very cheap mileage fares in economy class when booking with Alaska miles. This American Airlines partner flight–with a long stopover in Seattle–cost only 15,000 Alaska Airlines Mileage Plan miles. There are some particularly good sweet spots on the Alaska Airlines award chart with American Airlines, especially their off-peak flights. I flew to Barcelona on May 14th this year for just 20,000 Alaska Airlines Mileage Plan miles in American economy class, because Alaska follows the “old” AAdvantage peak/off-peak rules. 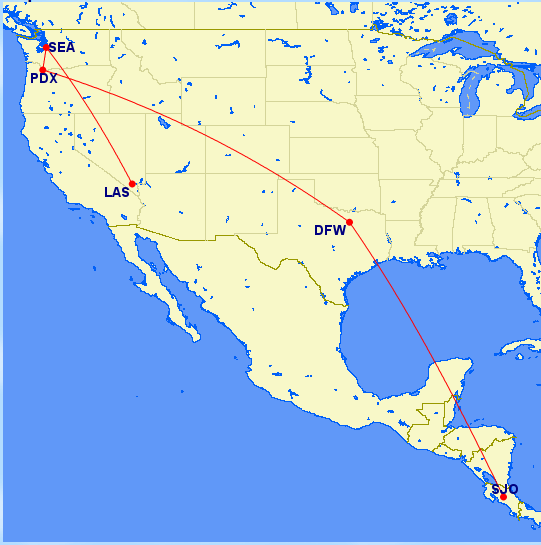 I also flew from Costa Rica to Seattle, enjoyed a long stopover, and will be continuing on my journey to Las Vegas later this month. This cost only 15,000 miles–also an off-peak award. These are some of the best deals on the Alaska Airlines award chart–and more importantly, these awards are achievable for ordinary people who aren’t flying every week or doing crazy stuff to get miles. There will likely be howls of protest from the blogosphere, but I don’t think they’re really justified. American massively devalued its own award program more than a year ago. It was untenable for Alaska Mileage Plan members to continue getting a better deal on American awards than AAdvantage members, particularly given that American flyers could easily credit their miles to Alaska. I knew this couldn’t last, and put my money where my mouth is: I have been burning my own miles on the best awards. What’s next? Well, divorce probably isn’t in the cards, not yet anyway. At the end of the day, American and Alaska need each other–Alaska has very strong service throughout the West that American doesn’t have, and American serves Midwestern cities Alaska doesn’t. So this is the stage of the relationship where Alaska and American are no longer sleeping under the same roof; they are formally separated. But they’ll still put on a brave face and show up at the middle school parent-teacher nights as a couple. All of the changes go into effect on 1/1/18, so you will have until then to earn and redeem at current levels. Booking good economy class tickets to Asia is always difficult. One of the biggest reasons for this is that many flights arrive poorly timed for onward connections to other destinations in Asia, meaning that you get stuck with long connections and forced overnights. When you’re flying in Seat 31B, you just want to get there as quickly as possible. 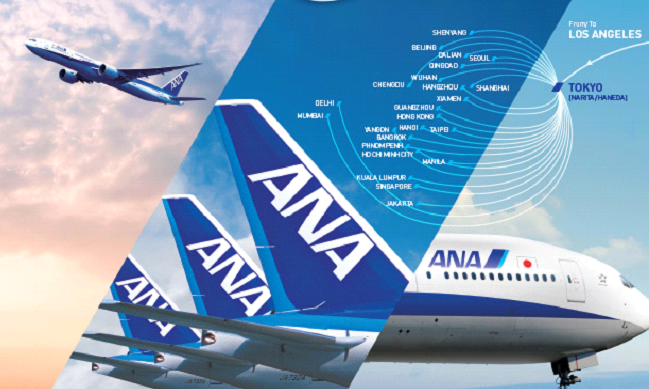 It’s always good to see a new Asia route with both good award availability and good timings for onward flights, and ANA is starting one on October 29th. They’ll be adding a third daily flight from LAX to Tokyo (Narita), which leaves LAX at 10:20am and arrives in Tokyo at 3:20PM. This is early enough in the day to allow for same-day onward connections from Tokyo to many destinations in China, southeast Asia, and even India. The timings aren’t really great for origination and departure traffic in Tokyo so this flight really seems geared toward carrying connecting passengers. ANA offers a solid economy class product including a pillow, blanket and even a pen to fill out your Customs forms. The food is edible and ANA flies newer aircraft. I’d gladly choose them in economy class over most other airlines with service to Asia (Asiana does, however, remain a cut above). You can book award tickets on this new ANA flight using StarAlliance miles (the most popular are United, Aeroplan, Singapore and ANA’s own program). It’s likely that cash pricing will be very competitive, since this opens up a whole lot of Asian cities to additional competition from LAX, so always compare the price of paid flights to award tickets. If you want to use miles, act fast – this new flight has opened up a lot of award availability to Asia, and it will not last. Asiana Club isn’t my favorite mileage program, but it offers middle-of-the-road value for StarAlliance flights and does offer credit on some Asiana fares that are hard to credit to other airlines. However, like its fellow StarAlliance partner Singapore, miles do expire on a rolling basis after earning. Unlike Singapore, whose miles expire 3 years after they are earned (meaning that Singapore defiitely isn’t an airline in which to accrue large mileage balances), Asiana miles expire 10 years after they were earned (or 12 years after being earned for elite members). And although Asiana’s mileage chart isn’t the best, they haven’t devalued as much (or as often) as other airlines. So it’s a reasonable program to consider if you fly Asiana a lot. I received an email today notifying of “enhancements” to the Asiana Club mileage expiration policy. I usually hate seeing these, because it means yet another devaluation. 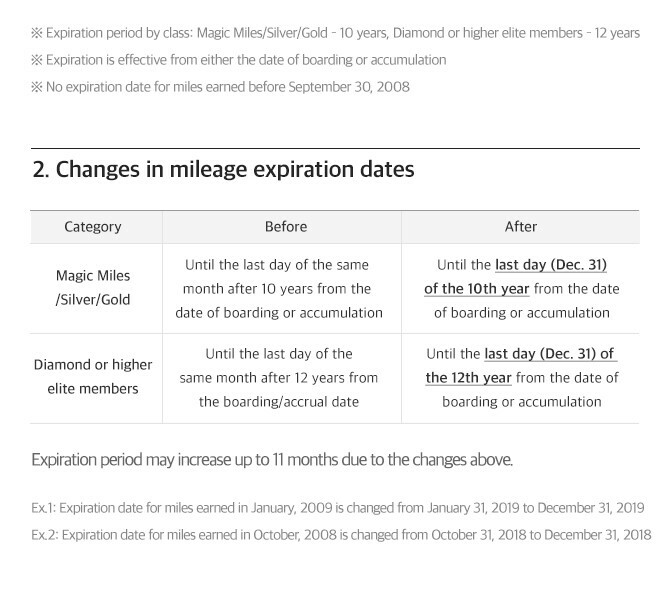 However, this time, Asiana has actually improved mileage expiration policies in a way that simplifies the program. The bottom line? You might get up to 11 additional months before your Asiana Club miles expire. However, you really shouldn’t wait that long–it’s likely that if you do, your miles will be worth far less at the time you redeem them.